OMG! Beer & Cupcakes Flight Night - Next Door Brewing Co.
Back by popular demand. Just as the names says, we are featuring a flight of our craft beer paired perfectly with a flight of mini cupcakes made with that very same craft beer, YUMMY! 4- 4oz pours and 4 mini cupcakes all for just $15. We are keeping it local for this Madison Craft Beer Week event. 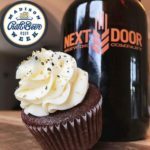 Our friends at Daisy Cafe & Cupcakery are providing the spectacular cupcakes made with our beers and we are pairing them to perfection. Supplies are limited but you can pre-order tickets to secure your order ahead by clicking here.